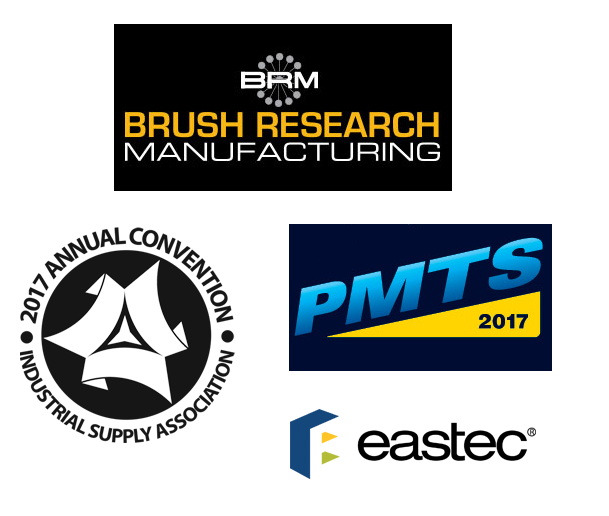 Brush Research Manufacturing (BRM) is hitting the road for three spring tradeshows. From April 22 to 24, we’ll be at ISA 2017 (Booth #1830) in Denver, Colorado. Then, from April 25 to 27, BRM will visit PTMS 2017 (Booth #1142) in Columbus, Ohio. Last but not least, we’re headed to EASTEC 2017 (Booth #5608) from May 16 to 18 in West Springfield, Massachusetts. Different tradeshows appeal to different audiences, but all three of these events aim to please. For surface finishing and deburring solutions, the BRM booth is where industry leaders will gather. That’s because when you meet with our Technical Team, you can ask questions and get answers to your specific metalworking challenges. Plus, you can see and touch BRM tools and technologies like these. BRM Flex-Hone® tools remove burrs and improve cylinder surface finish at the same time. These flexible honing tools come in a variety of abrasive types, including diamond for harder materials like carbide and ceramics. Flex-Hone® tools for industrial metals like aluminum, copper, and steel also set the standard for excellence. They’re the industry-leading choice for removing burrs while imparting a final finish. Flex-Hone® tools are available for any type or size cylinder, but come standard in tool diameters for bores between 4-mm and 36”. You can choose coarser-grit or finer-grit tools, but all BRM ball hones are self-centering, self-aligning to the bore, and self-compensating for wear. Flex-Hone® tools can be used with handheld electric drills, and with production machinery such as CNC equipment and industrial robots. BRM NamPower technology is a family of nylon abrasive brushing tools for outer diameter (OD) deburring and surface finishing. 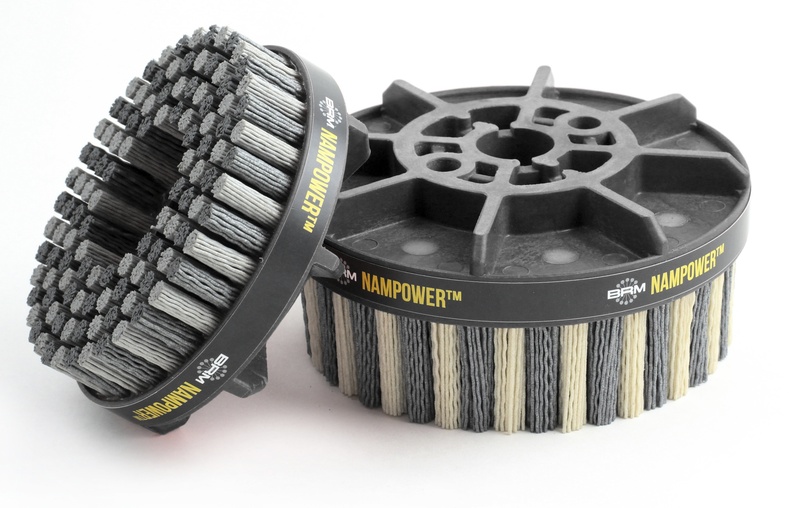 These high-performance products include disc brushes, wheel brushes, abrasive hex-drive tools, and NamPower accessories. For light, medium, or heavy-duty deburring, NamPower tools are a smart choice. Additional applications include rust removal, surface preparation, and weld cleaning. 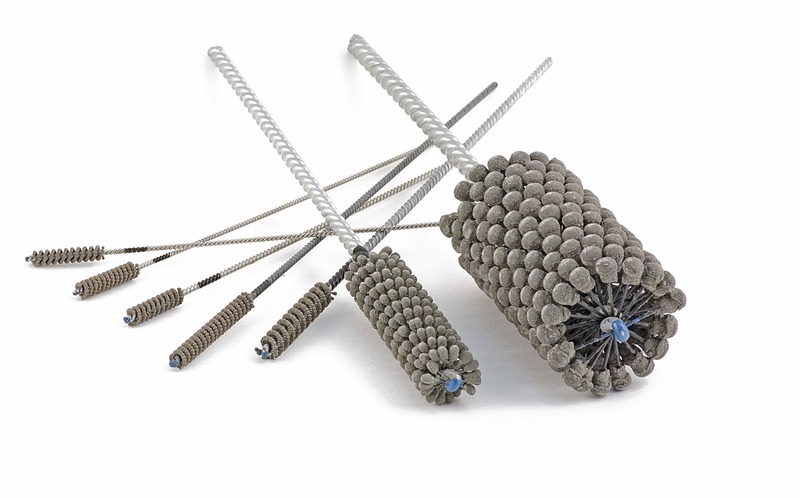 NamPower nylon abrasive disc brushes feature a unique combination of ceramic and silicone abrasive. Dot-style tools are great for light-duty applications. Turbine-style tools are the right choice for medium and heavy-duty deburring. NamPower wheel brushes can also meet tough challenges. For example, NamPower diamond wheels produce edge radii on hard materials like carbide, CBN, diamond, and glass. 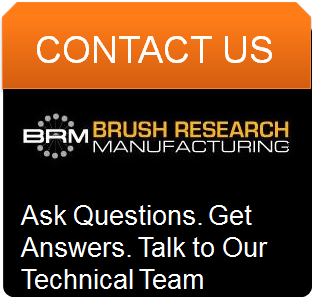 BRM also offers a full line of industrial brushes, including special tube brush kits for internal cleaning, rust removal, and surface preparation. 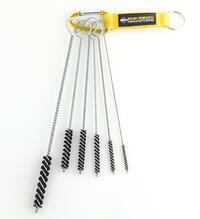 Each kit contains six ring-handled tube brushes with a carabiner for easy storage and handling. Fill materials include steel, carbon steel, brass, nylon, or natural bristle. There are three versions of this tube brush kit (A, B, and C), each with brush tools in a different range of sizes. Are you headed to ISA 2017, PTMS, or EASTEC this spring? If you need to solve surface finishing and deburring challenges, it’s time to connect with the BRM. Contact us to learn more or arrange a meeting.